You want to tell me a 10 second segment on NBC News about Burger King now selling hot dogs wasn't a buried ad? Did Donald Trump get a spray on tan? 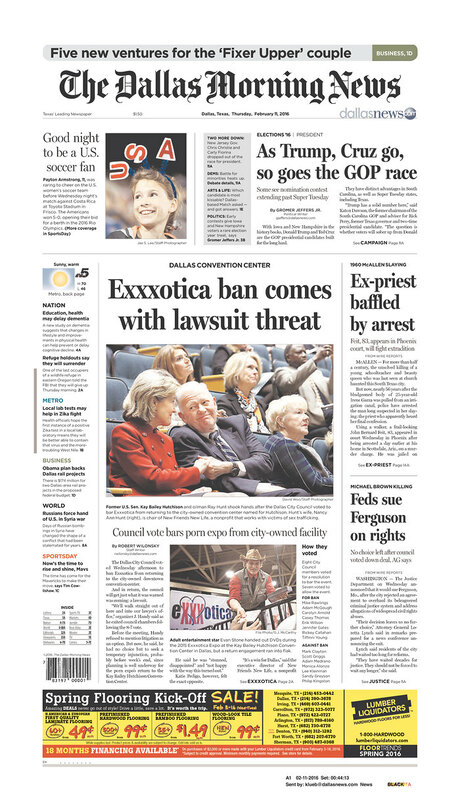 The Dallas City Council voted 8-7 to ban eXXXotica from the convention center. They will get sued, they will lose, and will have given the group more publicity then they could ever buy. Nice move. Why does Fox News have Karl Rove on from time to time? He's wrong about everything. And didn't he scam a bunch of people on a SuperPAC that he ran a few years back? And one more Fox News gripe: Does every guest have to promote a book? Is this a requirement? And Bill O'Reilly pimping his "Killing [insert name]" books is beyond belief. Especially since there is no chance he wrote even one sentenece. I may be the only guy in America who is not offended by Cam Newton right now. Hey, did I say the Waggoner Mansion was sold in yesterday's Random Thoughts? I mentioned Sirhan Sirhan the other day and now he's in the news for being denied parole. The Liberally Lean Curse continues. He is 71 years old. Looks like we might have yet another pregnancy up at the courthouse. The lady is in denial but a few of us listened to the facts yesterday and came to that conclusion much to her chagrin. She claims it is not possible, which gave rise to a funny comment by one of us of, "What if the doctor used a slip knot and it didn't hold?" The Update lists four deaths of people who are 51 or younger. Someone up at the courthouse said to me the other day, "Everyone has their price." I was a little taken aback but have thought about that way too much since then. You know, I think it depends on the price for what. I don't steal but if someone offered me $100,000 to walk into Walmart and steal a candy bar, I'd at least think about it. You ask me to throw a jury trial for $1 million I'd say no because I would never be able to sleep again. Stay out all night and face Mrs. LL's wrath the next morning for $1,000? That's a tough one. It's a game of hypotheticals which will drive you insane. But it's pretty fun.